Health care experts weigh in on the long-awaited Audit & Appeal Fairness, Integrity, and Reforms in Medicare Act. Highly anticipated and long overdue. These two descriptors sum up much of the industry's response to the Audit & Appeal Fairness, Integrity, and Reforms in Medicare (AFIRM) Act. Following years of ramped-up audit activity by the Centers for Medicare & Medicaid Services (CMS) and an unprecedented backlog of appeals cases, the movement toward the act's creation was set into motion in April 2015 by US Senator Orrin Hatch (R-Utah) during a hearing of the US Senate Finance Committee. The AFIRM Act (S.2368) has since passed the Senate Finance Committee, and is now pending in the Senate. Andrew Wachler, JD, a health care lawyer for more than 25 years and a principal at Wachler and Associates, PC, says the act is long-awaited recognition that providers are facing significant challenges as they try to get appeals cases heard in a timely fashion. While original mandates set expectations for cases to be heard in 90 days, Wachler points out that it's taking somewhere between 700 to 800 days. On the extreme end, some industry estimates have found instances where it took 10 years. "We just had a hearing two weeks ago for dates of service for 2007 and 2010," Wachler says, acknowledging that those cases did have some procedural delays. "Meanwhile, the provider's money is being withheld. It's a problem." According to Dawn Crump, MA, SSBB, CHC, vice president of audit management solutions for CIOX Health, the overall goal of the act is to reduce the burden on providers and improve the Medicare audit and appeals process. This also will reduce the burden on the Office of Medicare Hearings and Appeals (OMHA). "The proposal hopes to achieve this mostly through appeal reform by allowing alternate methods of resolving the disputes, increasing threshold caps to $1,500 for the administrative law judge [ALJ] to review, and developing better processes to communicate appeal status and outcomes to providers," Crump notes. "If passed, this will give the hospitals more access to the status of their disputed claims." It also may require hospitals to use different methodologies to determine what claims and what type of appeal to submit, she adds. Specifically, smaller dollar but high-volume claims can be grouped to go through an alternate dispute review approach much like a settlement or extrapolation method. Reviews not meeting the threshold may also be assigned to a skilled Medicare law attorney for adjudication. Chuck Buck, senior vice president of Panacea Healthcare Solutions, Inc, says the bill would require $127 million to be appropriated annually from the Medicare Trust Funds, beginning with the 2016 fiscal year. "A total of $125 million would go to OMHA and $2 million to the Departmental Appeals Board of the US Department of Health and Human Services [HHS], which handles Medicare Appeals Council reviews," he explains. "These funds will be used to address the primary causes of the increase in the number of appeals and the growing backlog at OMHA." Assuming appropriation of the specified amounts, estimates suggest that implementing the bill will cost $1.31 billion between 2016 and 2025. Buck points out that the 2015 Senate Finance Committee hearing provided a snapshot of the gridlock providers are experiencing with the appeals process following penalties incurred from Medicare recovery auditor activity. In his opening statement at the April 2015 hearing, Hatch said that Medicare's hiring of contractors to conduct claim audits has "led to a seemingly insurmountable increase in appeals with a current backlog of over 500,000 cases," resulting in long delays for beneficiaries and providers. A later report revealed that there were 1 million cases backlogged at OMHA. Hatch also noted that "large portions of the initial payment determinations are reversed on appeal" and "such a high rate of reversals raises questions about how the initial decisions are being made and whether providers and beneficiaries are facing undue burdens on the front end." "The system is fundamentally unfair," notes Wachler, pointing to the magnitude of dollars recouped in recent years: $2.29 billion in overpayments in 2012, $3.65 billion in 2013, and $2.39 billion in 2014. "With that kind of money being collected, you would think some funds could go to expand the number of judges," he says. "If you are going to up your activities by that much, you should correspondingly have additional appropriations for the right amount of judges … or don't withhold the money." Recommendations were made in a December report that the Senate and the House of Representatives further consider the bill. The report outlined the need for the AFIRM Act to address the rise in appeals that had resulted from the expansion of audits and the magnitude of the appeals backlog for ALJs. According to Debi Primeau, MA, RHIA, FAHIMA, president of the Primeau Consulting Group, the bill technically has been placed on the Senate legislative calendar, but, as of press time, a floor vote had yet to take place. "I haven't heard any rumblings yet of the committee's intention to push Senate leadership for a floor vote," she explains. "I know the committee has been primarily focused on putting together their big chronic care legislation which we should see in the next month or two." In theory, the bill will create shorter time frames for the appeals process, improving the current "three-plus year process that is currently holding up financial reconciliation of disputed claims," Crump says. • Improve oversight capabilities for HHS and CMS that increase the integrity of the Medicare auditors and claims appeals process. • Coordinate efforts between auditors and CMS to ensure that all parties receive transparent data regarding audit practices, improved methodologies over time, and new incentives/disincentives to improve auditor accuracy. CMS would create an independent ombudsman for Medicare Reviews and Appeals to assist in resolving complaints by appellants and those considering appeal. The creation of this position would further increase the transparency of the appeals process by publishing data regarding the number of determinations appealed, each appeal's outcome, and aggregate appeal statistics for each contractor and provider type. • Establish a voluntary alternate dispute resolution process to allow for multiple pending claims with similar issues of law or fact to be settled as a unit rather than as individual appeals. • Ensure timely and high-quality reviews, and raise the amount in controversy for review by an ALJ to match the amount for review by district court. For cases with lower costs, a new Medicare magistrate program would be created to allow senior attorneys with expertise in Medicare law and policies to adjudicate cases in the same way as ALJs. This would allow more complex cases to retain the full focus on the ALJs. • Allow for the use of sampling and extrapolation, with the appellant's consent, to expedite the appeals process. "The appeals process would be revised if AFIRM is passed," Wachler says. "The reforms are directed at improving the efficiency of the appeals process." For example, providers would have access to alternative dispute resolution and consolidation of appeals at the lower levels of appeal. In addition, in an effort to clear the ALJ dockets, Medicare magistrates would review cases with lower amounts in controversy. This would help alleviate appeal backlogs and allow appeals to move through the process more efficiently. Wachler suggests that the most important aspect of the act is the appropriation of $125 million per year for OMHA and $2 million for the appeals council. In fact, he notes that Judge Nancy Griswold, chief ALJ for OHMA, pointed to the appropriations as the most significant piece of legislation since the appeals processes came out in 2005. "She said it would essentially double their budget and the number of administrative law judges," Wachler notes. Alternative dispute resolution methods have been needed for some time, Wachler says. "The problem with the system is that there has never been a way to settle these cases," he says. "Alternative dispute resolution mechanisms are an integral part of resolution hearings. That's a significant part of the problem. If [alternative dispute resolution] becomes an integral part of resolving cases, that could be helpful." A similar facilitation program for alternative dispute resolution was recently unveiled by OMHA for Medicare Part A appeals. While language in the AFIRM Act could require the establishment of alternative dispute resolution processes, including mediation, Wachler points out that it is also taking place independently. "Although OMHA is instituting some reforms, this would be a broader reform available to everyone," he explains. Wachler believes that the appropriations and alternative medication options together could have a significant impact. "Fundamentally, you have to appropriate the funds for enough judges; you have to have an effective mediation and settlement process," he says, pointing out that while the provision exists, CMS hasn't necessarily had incentive to settle. "Where's the corresponding pressure on CMS?" • Recovery auditors would be prohibited from conducting patient status reviews (ie, hospital inpatient vs outpatient reviews) more than six months after the dates of services if the claim was submitted within three months of the date of service. • Implementation of a remand process to redetermine new evidence introduced by an appellant at reconsideration, ALJ, and Medicare Appeals Council levels. Allowances for the use of sampling and extrapolation could benefit providers where there is high expectation for overturning a denial, Crump notes. "Appeal team managers will need to review what [they are submitting] and how they are submitting appeals to take better advantage of grouping appeals by issue type," she says. For example, in a case where a health care organization is appealing 30 denials, the process would be streamlined, allowing claim appeals to be completed in one fell swoop. Wachler cautions providers to be careful how they use this system. "[There are] judges who approve very little and judges who approve a lot," he says, noting that it could be like spinning the roulette wheel on all appeals, a risky proposition, especially if an organization draws the wrong judge. If the system allows for a panel of judges, Wachler advises moving forward with the statistical sampling. "Complex and high-dollar cases will still go through the normal process through the ALJ, and we will likely see no rapid changes in that current process," Crump says. 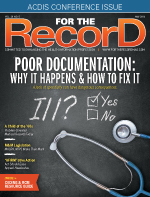 If AFIRM passes, Buck notes that coding managers and clinical documentation improvement specialists must continue to code medical records with the highest degree of accuracy while being mindful of the Fraud Prevention System, a sophisticated predictive analytics tool used by CMS to identify claims in real time that may meet their criteria for fraud and abuse. Crump says coding managers also must ensure that the financial impact of code change denials meets the threshold caps for appeals. "If the website provides the information that is being recommended (outcome decisions by type and ALJ, as well as the average length of time before final decision), coding or appeal managers should use that information into their coding appeal decision process," she suggests. Wachler believes that the changes could reposition how health care organizations view their coding practices. Pointing out that the billions of dollars recouped in recovery audit contractor (RAC) denials have been primarily associated with inpatient claims, he notes that some health care organizations were opting to code using the less risky option of "observation" under Medicare Part B even though it would produce lower reimbursement. "This is before the two-midnight rule when you had certain relatively subjective criteria, and the RACs were denying anything they could get their hands on," he says. "So, coders are being told, 'We can't afford to take a risk and put these people [as] inpatients and not get paid. We're better off taking less money and putting them on observation under part B.'" Wachler emphasizes that coding professionals are under pressure to get it right, "but there are shifting sands on what is right." As a result, his advice is simple: "Know your craft, be trained, know documentation requirements, and do the best you can. I hate to see people undercode and not get the money they are entitled to." — Selena Chavis is a Florida-based freelance journalist whose writing appear regularly in various trade and consumer publications, covering everything from corporate and managerial topics to health care and travel.